The Karcher K5.540 is the top of the line electric pressure washer from its X-Series range that delivers exactly 2000 PSI at 1.4 GPM using patented water-cooled induction motor. Designed to outlast any other pressure washer, this machine packs in the power of induction motor with the ability to operate non-stop for longer periods. It provides two spray wands, an onboard soap solution storage compartment and comes with a DirtBlaster Spray Wand that helps you increase pressure by 50 percent. For low-pressure cleaning, the VPS or Vario Power Spray wand handles regulated pressure exactly as much as is required. You can even connect a garden hose with the right quick connect adapter with this pressure washer. Changing pressure settings is as easy as switching between the two wands. One produces a fan-shaped water flow with reduced pressure, the other provides a cone of a high-pressure water jet. Both wands have their use but I feel as if something is missing here. Having interchangeable nozzles usually helped me properly regulate the pressure output and the flow pattern but in the Karcher K5.540, tinkering with the nozzles does not seem to increase or decrease the pressure by much. In fact, I am starting to wonder if it really does produce 2000 PSI. Nevertheless, once you get used to the two wands and learn how to use pressure washer detergent with the onboard tank, cleaning becomes easier. Practically noiseless is what I find the Karcher K5.540 to be. The first time I started it up, the motor came to life, purr slightly and then settled down. Ever since then, I only hear the water pressure create all the noise. The motor hardly makes any ruckus. As I mentioned before, the pressure output seems to be less than 2000 PSI but in comparison with a 1700 PSI electric pressure washer, it does produce more force. Maybe, the wand design is to blame. Regardless, I feel that it has got sufficient pressure to handle anything and everything that a homeowner could dream of. Cleaning the patio, driveway, and furniture with this machine is super easy thanks to the onboard storage tank and because you can regulate the power output with the two wands instantly, it removes the hassle of changing out nozzles and tips. For household chores, 2000PSI at 1.4 GPM is more than sufficient. This is a commercial grade electric washer that delivers a constant 2000 PSI for more than 2 minutes and does not overheat. It lets you spray the entire surface with a detergent solution and can instantly clear the detergent away with the high-pressure wand, without taking a break. The induction motor is probably the biggest advantage on the Karcher K5.540. Okay, so the only place where I feel the Karcher K5.540 falls flat on its face (quite literally) is in terms of durability. The induction motor and pump are not the culprits here. It is the upright design of the pressure washer which is to blame. On uneven surfaces, it loses balance and topples over to the front. This has happened with me twice and each time the plastic female quick connect hose fitting broke off. 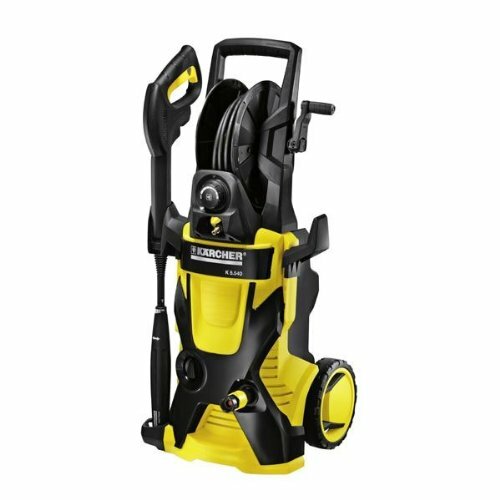 Problem is that the only replacement in the market is supplied directly by Karcher. Karcher has had mixed reception from customers in terms of customer support. Some say that they are unresponsive and at times unfriendly while others vouch by Karcher’s technical help. In my experience, Karcher is one of the few remaining companies that offer US tech support and does not outsource its technical department outside the country. And even if they did, I never once got the feeling that my problem would not be fixed. 1-year warranty from Karcher does cover the majority of the components other than the connectors and joints or O-rings. See more Karcher Pressure Washers. Comes with N-Cor Pump – Karcher’s Patented Sel Priming Pump. High-pressure electric washer designed specifically for residential usage. Quick connect mechanism, pressure hose reel, detergent tank and water cooling for the induction motor. Comes with DirtBlaster spray wand, Vario Spray Wand, Trigger Gun, and an accessory storage bay. Upright design with a 1-year limited warranty. Lightweight, compact, steady and quite easy to use. Hardly needs any tinkering to get started or to operate. Lots of power at a decent GPM. Prone to falling over because of its vertical design, plastic components and susceptible O-ring design may decrease longevity. If you want a brand name that you can depend on then the Karcher K5.540 is perfect for you. Top of the line, X-series induction motor with water cooling and dual wand operation, on board detergent tank, long shelf life and easy operations, all make this an indispensable pressure washer to have around within the house. 2000 PSI also lets you perform most outdoor chores too and so it can eliminate the requirement to get a large gas washer if you have a massive backyard or outdoor space.